Update: This post was published on Saturday, but was moved to the top for awhile. Scroll down for more recent posts, including one on state-sponsored indoctrination in Norway, a report from the EDL. Takuan Seiyo’s latest essay takes us into the strange distorted multicultural landscape of the 21st century, where Barry Soetoro can be elected president of the world while the West abolishes itself. Mainstream media no longer form the same moving wallpaper in everyone’s parlor, as they did until merely twenty years ago. But having been the prism that refracted and colored the world view of the boomers and their children — i.e. the two generations steering the course of the West since World War II — their influence is still enormous, and pernicious. It would be impossible to digest all the aspects of this phenomenon in a readable article, for a public library the size of Grand Central Station could be stocked with just the relevant analysis books and articles, plus primary evidence in the form of newspaper and digital clips going back decades, in 50 languages. In my own library, The Left-Leaning Antenna, by Joseph Keeley, was published in 1971, and A Slobbering Love Affair: The True (And Pathetic) Story of the Torrid Romance Between Barack Obama and the Mainstream Media, by Bernard Goldberg, was published in 2009. That a pot-addled subversive slacker named Barry Soetoro became The Most Powerful Man in the World is of course a tale of a serendipitous creature embodying Western intelligentsia’s most profound wishes and therefore built up by the Mass Media of Mass Lunacy into a mighty Frankenstein, a golem. But this is a daily pattern in the Western MSM, everywhere and in everything related to culture, nationhood, race, gender, people, values, history, economics and so on. Of late, its biggest manifestation was in the media’s retelling and completely rehashing the story of the encounter between a community volunteer Hispanic immigrant named George Zimmerman, and Trayvon Martin, an Afro-American hood-in-a-hoodie, into drugs, hos and violence. It’s fortunate therefore that sometimes, a small shard, found, may tell the story of a lost civilization, Such a shard landed on my desktop last week in the form of an article in Der Spiegel entitled “Why Islam Is an Integral Part of Germany”, by Bernhard Zand. Mr. Zand starts out by quoting three major German Christian politicians who opined publicly that Islam is an integral part of Germany, and then two who said that no, it isn’t. His ire is particularly burning concerning Germany’s Interior Minister Hans-Peter Friedrich, who asserted that Islam has no part in Germany’s identity, it having been formed by Christianity and the Enlightenment. Every part of that argument is false. First, the Enlightenment and Christianity are perfectly mixable, for the inception of the former was inextricably entwined in the reformation of the latter. The majority of key Enlightenment figures in Germany, France, England, Scotland and the United States were practicing Christians; many spent time in seminaries and in Christian theology studies, and some were ordained clergymen. A small sprinkling of notable and committed Enlightenment Christians would include Francis Bacon, Pierre Bayle, George (Bishop) Berkeley, Charles (Abbot) de Castel, Etienne (Abbot) de Condillac, René Descartes, (Reverend) Adam Ferguson, Johann Fichte, Hugo Grotius, Johann Herder, Francis Hutcheson, Gottfried Leibniz, Isaac Newton, Blaise Pascal, and (Reverend) John Witherspoon. They did have a new concept of truth based on reason rather than on one or another competing confession of Christianity, but that was a modification rather than repudiation. In addition, the American Enlightenment, grounded in English and Scottish ideas, applied Christian beliefs to bolster liberty and tolerant republicanism. Zand’s further premise that World War II destroyed German culture’s roots in the Enlightenment and in Christianity fares no better under scrutiny. Just the German names among the above, plus Goethe, Schiller, Beethoven and many others belie the first part of the statement. His questioning the Christian foundation is so absurd that two arguments in thousands — many thriving churches, cathedrals and the current Pope among them — will suffice. Germany and the rest of the West have the technology of print, and experienced the Renaissance, Enlightenment and the Industrial Revolution in consequence, because Johann Gutenberg printed the Bible. And Modern German is the fruit of Martin Luther’s translation of the Bible into German. First, the entire Anglophony, Denmark, and anti-Nazi elements in every European country including Germany itself must be exempted from such a statement. Second, the Enlightenment was not only about humanism but also about promoting science and an empirical perception of the world instead of the dogma and superstition by which it had been perceived before. It’s only the Progressive disease that sees humanism only. Third, the Nazi period is a terrible and eternal stain on Germany and on humanity itself, but the precepts of Christianity and the Enlightenment survived Hitler. Moreover, they would be grown, twisted and misapplied by precisely such guilt and shame-ridden masochists like Bernhard Zand and the rest of the lefto-”humanitarian” German and Western elite. But guilt, shame, fear and anger are feelings. And feelings cannot substitute for a rational reading of the affairs of man — especially in an academic or journalist whose job, by definition, calls for a credible and impartial analysis of reality. Zand reaches surreal absurdity when he takes Germany’s President Joachim Gauck to task for having the temerity to state that he, Gauck, understands those who question the assertion that Islam shaped Europe. Sharing with the reader his rare erudition, Zand snipes, “Maybe the well-read president will open his dictionary and, just taking the first letter as an example, look into the etymology of words like “admiral,” “algebra,” “alcohol,” or “atlas.” He forgot “assassin” though. Zand also advises President Gauck to visit Andalusia, Mallorca, Malta and Bosnia, to attend a performance of Mozart’s “The Abduction from the Seraglio,” and to “take a look at the history books” to find out about Sultan Mehmet II, the conqueror of Constantinople in 1453, who established a Muslim empire that impacted Europe for three centuries. “The potential insights Gauck might gain by doing so could help him gradually begin to fill in the anthropological trenches left behind by the attacks of September 11, 2001,” counsels Mr. Zand with precious perspicacity. But all his verbiage is akin to preaching that a bad driver who ploughs his vehicle into another has an integral part in the damaged vehicle. Mr. Zand might join me in a visit to 10th century Andalusia to check on the thousands of European Christian and African slaves there, many castrated by their Muslim masters. Or maybe a quick side trip to 11th century Cordoba and Granada, to observe the Muslim pogroms of Jews. Should a whiff of maritime air be preferable, Mr. Zand might join me for aperitif on the terrace of Gran Hotel in Mallorca, for a vantage view of the early 13th century forcible conversion of the island’s Christian population by its Almoravid rulers. 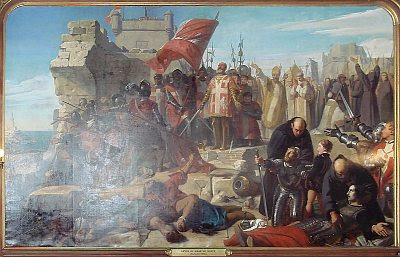 Another useful excursion I might propose to Der Spiegel’s esteemed Islamologist is for the purpose of filling in the anthropological trenches in Malta on 23 June 1565, when the Turks, having captured Fort St. Elmo, killed all the defenders, estimated at over 1,500 men, and then floated their decapitated bodies across Malta’s Great Harbor on mock crucifixes. Bigger anthropological trenches and more Eurabian fun may be got by participating in the 24-hour fiesta following the 29 May 1453 breaching of Constantinople’s walls by the Turks. It’s on account of this feat by Sultan Mehmet the 2nd that Mr. Zand advises the President of Germany to hit the history books concerning the West’s “standing on Muslim legs.” I particularly recommend the anthropological trench in front of the Hagia Sophia, and don’t forget an authentic tour guide by a man who was there. Love those coincidences. It’s like the lowering of crime rates in New York that always coincides with increased rates of incarceration, leading The New York Times to complain in headlines like “Despite Drop in Crime, an Increase in Inmates”, or “Number in Prison Grows Despite Crime Reduction”. Indeed, let us not forget that Der Spiegel and Bernhardt Zand are not singled out for opprobrium here, but just serve as a small sampling of a much larger syndrome. Neither Mr. Zand nor his employer stand out negatively when lined up with Time or Le Monde, NBC or BBC, or practically all major mass media franchises with very few esoteric exceptions like Washington Times. Nor is the issue of Islam handled in Spiegel any more preposterously than most any issue dealing with this postmodern world is handled elsewhere in the MSM fog bank. But it’s time to finish our educational tour with my humble self and Bernhardt Zand attending the Lübeck Theater’s performance of Mozart’s “The Abduction from the Seraglio.” It’s the very performance that Mr. Zand advises President Gauck to attend so that he may learn that Islam did shape Europe and is an integral part of Germany. The title itself drips with Islam’s cultural enrichment. The plot evolves around Muslim pirates’ abduction, enslavement and sale of a noble lady, Konstanze, to a Turkish harem, and her eventual liberation by her betrothed, Belmonte. This opera’s most famous aria bears the title Martern aller Arten (“Tortures of all kinds”). A hint? Mr. Zand’s German is better than mine, but maybe he forgot his hearing aid at home. “Why Islam Belongs in Germany” concludes with an unbeatable argument: President Joachim Gauck, a former East German, longed for the West, and that’s why he is in Germany. Muslims are in Germany because once they longed for the West. And that’s why Joachim Gauck — an ethnic German from a long line of German seafarers and once a dissident Lutheran pastor defying the Stasi — and the Muslims, from a profoundly alien culture with a history of 1100 years of hatred and warfare against Germans and kin peoples of the Germans, both belong in Germany. I shall not miss borrowing this train of reasoning next time I speak with Scarlett Johansson. Scarlett’s father longs to be with her. I long to be with her. And that’s why we both belong with Scarlett. For her to fail to see this obvious moral imperative is overt and reprehensible takuanophobia. It is hard to imagine a more stupid piece of polemics than “Why Islam Belongs in Germany”: mendacious, carefully selecting quarter-truths to reach a predetermined conclusion belied by the missing three quarters, badly reasoned, skirting every single important issue of relevance and, to top it off, comically smug and arrogant, basking in its own superior knowledge and understanding. The question is why. Why is this journalist and this magazine deluded on Islam? And why are all Western mainstream media deluded on every subject of importance they touch? As to Islam, Mr. Zand is probably a true believer in what he preaches, but personal benefit must be playing a role. He is, after all, Der Spiegel’s Middle East/Gulf correspondent stationed in the United Arab Emirates. Buttering up Muslim interest has obvious advantages. Conversely, writing anything negative about Islam or Muslims would result in loss of journalistic access, therefore a career handicap. In the worse case, if the truth really stung, Zand might be forfeiting his life. After all, introspection, objectivity, self-criticism, fealty to universal ideas rather than to tribe and prophet are Western characteristics rare among Muslims . I do not know whether such Occam’s razor applies to Der Spiegel too. There is no question that concerning Islam and its impact on the West, the opinions of important Western opinion makers are for sale. One need only remember Saudi Aramco’s ties to American politicians, and Saudi Prince Alwaleed’s investments in News Corporation and AOL/Time Warner and in Islamic Centers in Cambridge, Harvard and Georgetown universities. Similar “investments” have been made by other Muslim plutocrats like the Emir of Qatar. But maybe that’s not the case with Der Spiegel. This is Europe’s largest and among the world’s most prestigious news magazines. Its German circulation is 1 million, with popular additional German and English Internet portals. It prides itself on quality. What then can Der Spiegel gain from promoting the Islamization of its home country? Simple fear is likely one of the motivations. There are already 4.5 million Muslims in Germany. Angela Merkel said in 2010 that Muslims have transformed Germany, and its hapless erstwhile owners will have to get used to more mosques than churches. Germany Muslims’ numbers are growing, their negative impact is growing, the German population’s anger is growing, the neo-Nazis in Saxony and elsewhere are growing, but the insane premise that millions of Turks, Moroccans, Somalis, and Afghans would live in a multiculti highboy country or acclimatize as Germans is fading by the day. Perhaps Spiegel’s editors hope in the manner of Sweden’s Minister for Democracy [sic!] Jens Orback that they must be open and tolerant toward Muslims because when Germans become a minority in their own country, the Muslims will be good to them. In Bavaria, Spiegel’s comrades in the Progressive confession are already forcing school children to study Islam and learn Turkish for the sake of “a good atmosphere and mutual understanding”. It’s all the same, you see; competing narratives. Real Germans’ Islamophobia is a victory for intolerance, but Der Spiegel’s and Germany’s cowering before Muslim fanaticism is not a victory for intolerance. German right-wing dislike for Muslim presence in Germany is similar to Muslim invaders’ dislike for Germans who are German. It’s just extremists versus extremists; a plague on both their houses. The killing of a German jihadi by a U.S. drone is raining death that warrants diplomatic tensions with the U.S. But terror from the sky unleashed on the U.S. by the 9/11 jihadis from Hamburg is not the raining of death that calls for diplomatic tensions. There is however, a greater and more inchoate fear seeping now into Der Spiegel’s editorial offices and into the brains of the socialist-globalist elite in the media, government or the academe: fear of the wrath of Germans in Germany, and Britons in Great Britain, and America’s founding population in the United States. The peoples whose countries are being destroyed by those whom they believed to be their best and brightest. Spiegel, in German, means “mirror.” But at no time in history, save for the aberration of the Bolshevik and Nazi regimes have mainstream Western media like Der Spiegel constituted, severally and collectively, a mirror of such bad magic: Lewis Carroll’s mirror from his eponymous book. It’s a mirror pretending to reflect this world, but in fact it takes its users to a twisted alternative reality of nightmarish consequences. 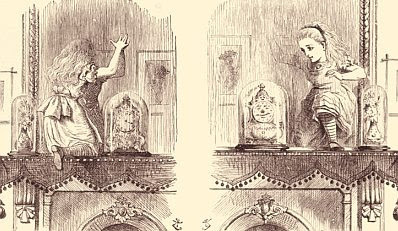 For Carroll’s Alice is was Jabberwocky and a chessboard landscape, a queen who was a talking sheep, and an egg-like character whose idea of language was, “When I use a word, it means just what I choose it to mean.” And for any modern-day Alice that touches Germany’s Mirror or any such mirror in any Western country, it’s a conduit into a land where Islam is the Religion of Peace and the legs on which Europe stands, diversity is strength, the West’s main challenge is to cure Whites of their racism, race is a social construct, gender is a matter of choice, women make fit Marines, men make fit wives of other men, Germany and Greece belong in the same monetary union, excessive government debt may be cured by more government debt, the fount of prosperity is taxation, and there is no truth but only different narratives. For 50 years it worked, but this Grand Jabberwocky started falling apart in the 1990s under offended Reality’s blows. The mega-scam of massive Third World immigration resulted not in the promised material or cultural enrichment but in the depletion of social capital and fiscal reserves. Equal rights for blacks turned into racist discrimination against white males and an increased alienation of blacks. Welfare turned into an opium derivative dispensed by socialist drug pushers on government payroll. The hailed panacea of cheap imports from China turned into pulling the rug from under the Western middle class and financing the rise of a hostile military colossus. Capitalistic entrepreneurship turned into mega speculations in fictive financial instruments. Real estate mortgages morphed into dubious securities packed with lies. The multi-party republican democracy turned into a one-party Liberal-progressive monopoly in two or three flavors. Mass entertainment turned into a stream of filth, decadence and stupidity offered in 500 flavors. Forcing tolerance and conciliatory obfuscation about The Religion of Peace yielded 9/11, and Theo Van Gogh, and USA Major Nidal Malik Hasan. And now, all that is accelerating. 100 years ago Ludwig von Mises predicted a crack-up for all booms caused by governments’ pumping of conjured credit. The Keynesian fraud that all Western governments preferred to Austrian common sense is now crumbling, along with its fiat “faith-based” currencies. The crisis revealed what once was the stuff of only the most paranoid conspiracy-mongers: Governments supposedly of the people, by the people, sacrificed the people to bail out a thin layer of multimillionaire bankster piranhas from the consequences of their own greed. The anti-Hitler secular antifascists are now the fascists in alliance with Heinrich Himmler’s favorite religion and completing the final round of der Führer’s dream of a Judenrein Europe. The time is nigh when barbarian minorities imported by the West’s ruling elites will become majorities. Decades of multiculti and anti-”racist” indoctrination have brought a resurgence of the real thing, Nazism. 48 years of reverse racial discrimination and trillions of dollars in transfers from white taxpayers to black recipients, even the election of a “post-racial” president, have yielded not the touted racial reconciliation but an open intifada of blacks against whites, the biggest chasm between the races in fifty years, and millions of whites growing in awareness that the media newspeak enveloping them hides a rotted reality. The architects of this repulsive reality — governments, judicial systems, supranational organizations, universities and the mass media — fear this dawning consciousness enormously. For they, unique in history but for that Greek wooden horse in Troy, have conjured the destroying fog of utopian nonsense, spread and enforced it with legal sanctions and the power of manufactured consent. But no, they can’t. The problems created by the likes of Barroso, Brown, Blair, Obama, Clinton, Zapatero, your random Swedish Minister of Integration and ten thousand other national and local politicians and their Amen corner in mainstream media cannot be solved by any future generation. A Götterdämmerung, a Ragnarok, a Kali Yuga will solve them, but that will be the doing of offended Nemesis. And it’s at Barroso’s feet now, and the feet of all the captains of the West’s ship, that this future “solution” has to be laid. The curricula vitae of those captains, by the way, are astonishing. Mr. Barroso himself is the past leader of the Communist Party/ Revolutionary Movement of the Portuguese Proletariat. A short foray into the CVs of other drivers of the unfolding disaster, such as Germany’s Joschka Fischer and Daniel Cohn-Bendit, Norway’s Thorbjørn Jagland and Jens Stoltenberg, America’s Barack Obama and Nancy Pelosi, on and on, is equally revealing. And that’s why all that palaver in Der Spiegel and New York Times and BBC and MSNBC — “expert” advice from the likes of Bernhard Zand on Islam or Paul Krugman on the economy, or Keith Olberman on the Tea Party. It’s just leaning further on the tiller of madness, refusing any scintilla of admission that it is madness, yet realizing that the unwashed multitude, those devoid of the gnostic secrets of the anointed, are beginning to perceive the madness. Der Spiegel is a particularly sorry case, because it prides itself on its investigative journalism, thorough research, in-depth examination of topics, and dependable quality. Columbia Journalism Review called it “the world’s largest fact-checking operation.” But what’s the use of fact checking if the brains of the fact checkers have been corroded by an ideological disease? The German magazine could easily rid itself of its hallucinatory nonsense by hiring the few people who have the qualifications and the untainted perceptions. In matters of Islam and Muslims, what Mr. Zand reports from the Middle East could pass through the desk of his supervising editor Peder Jensen (aka Fjordman). Thilo Sarrazin alone, if put in charge, could cure all of Der Spiegel’s insanity in matters of political, social and economic reportage. But I don’t expect that such appointments will be announced in the near future; the momentum of the leaking vessel is huge beyond measure; a radical turn of the rudder seems inconceivable on the control deck. Let us nevertheless not fall into the trap of singularity. Here is a recent item in The Washington Post, a mirror just as tainted as Der Spiegel: “Baby boomers had better embrace change”. The menacing tone of “had better” gives the game away. The purpose is like that in dozens of similar articles in every Western country destroyed by its guiding elite in the last fifty years: to convince its readers that the new demographics is here, the minorities will become a majority, it’s inevitable, embrace diversity, stop clinging to your obsolete white culture, “invest” in the young minorities’ tide with your [increased] tax money, so that 85-IQ semi-literates from 100 retarded cultures can become the doctors, engineers and inventors who will support your retirement. Well, the WaPo writer does not quite put it the way the preceding sentence does, but that’s just because people who can cut through the fog of insanity have no hope, ever, to write for the WaPo. The peoples of the West have fashioned their image of man and society, and of themselves, largely from words and images relayed by the mass media and the values embedded in that content. Not many are aware that what they are reading and apprehending is not the coherent, rational prose in English, German or French that it seems to be, but the Jabberwocky of a warped mirror reflecting defective mental chips in otherwise sleek transmitters: highly educated, with outlying IQs and notable talents. 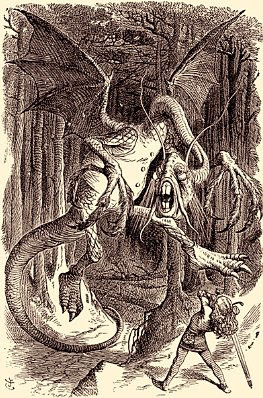 And here is a maxim to draw from this state of affairs: Cute and cuddly as though it seems, hopey and changey, humanitarian and tolerant, open and democratic: Jabberwocky kills. 1. Per University of Calgary’s “The Islamic World to 1600”. 2. No statement about any group of humans is valid absolutely. The likes of Wafa Sultan, Ibn Warraq and Ayaan Hirsi Ali exist, by they are the outlier conspicuous in its rarity. 3. T.S. Eliot, The Dry Salvages. 4. Tip of the hat to Lewis Carroll for the first four lines of this ditty. Reading Takuan Seiyo is like getting caught in an avalanche. Think I'll go plant some vines for food. Barak Assassin Obama, King of America, has proclaimed citizenship for illegals. Hey, GOV, thanks for more German articles as I requested. Couldn't agree more. The secular-progressive elites, in love with their quasi-religious ideology, will end up destroying us all. Like the greeks said: "The gods first blind those they wish to destroy". Too bad they take others with them. Shock and awe! This essay is a must read for my eleven year old patriot. Not today. Later... Bookmarked it,off course. What can i say? This essay sums up the crisis we are in. Sort off. I think we have to use it as a guideline. A guideline for real change. To bad we ar surrounded by mediocracy and idiots. Democracy is a system in which two idiots can out vote a genius. We have to change the system. Either you pay and have the right to vote or you dont add anything and you dont gett to vote at all. Great article! A minor thing: "Missgluckt" means "failed" not "unlucky", which implies a different slant to the article within the magazine than that hinted at. I have not read it though. Excellent article, it's always satisfying to hear someone else convey your thoughts accurately. Maybe imparts in a fractional degree the relief that Elijah surely felt when The Holy One informed him that he wasn't alone in his defiance of Baal. The only aspect of the article that immediately struck me as lacking was the explanation for this whole seemingly criminal conspiracy. Everything endeavored by mankind ever has always had a spiritual element and I dare say today is no different.In short, a society that has rejected God is now standing alone to face another so0xiety with an extremely evil yet potent god driving his followers on to an inevitable victory. The sad reality which we are now witnessing is that even an evil god will triumph no god. Thanks; you are right about missglückte. I acted on the long-ago half-Polish patois of my native Schlesien, and under pressures of all kinds forgot to check the word in a standard dictionary. However, I shall let this mistake stand, for two reasons. 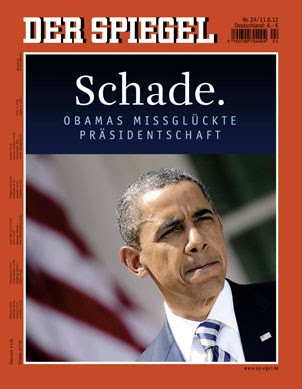 First, it does not change anything about Spiegel's misreading of Obama. 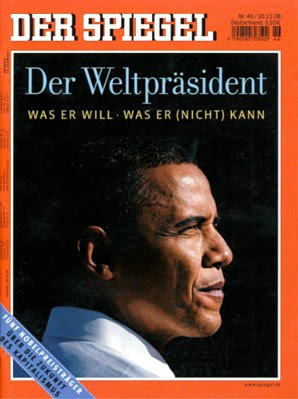 The Obama presidency's failure announced on that June 2012cover was plainly visible and predictable to anyone with eyes to see in November 2008, when Spiegel crowned Obama "President of the World." Cheer up, Takuan. Here's a Spiegel article where the author whines that Germany is no longer a welcoming place for Third World invaders. The majority of Germany's politicians -- and presumably also the German people - are of the opinion that the country has already had enough immigration. There may be minorities such as Economics Minister Rainer Brüderle, employers' associations, the German Chambers of Industry and Commerce (DIHK) and the German Engineering Federation who are calling for new immigrants, but no one appears to be listening to them. No one is listening to these corporate hacks who want to flood Germany with foreigners in order to drive German wages down? Wall Street's going to have a conniption fit! Unfortunately, the immigration policy based on these reflexes is "effective": Germany's borders have been virtually sealed. Tougher asylum laws mean that Germany has practically stopped accepting refugees. In 2008, only 233 people were granted asylum. "Effective" immigration restrictions? Sealed borders? Tougher asylum laws? These are crimes against Holy Diversity itself! After Germany stopped recruiting guest workers in 1973, the main way to emigrate was for family members abroad to join their relatives in Germany...Since then, an ever-dwindling number of Turks have been emigrating to Germany. Their net immigration plunged from 10,130 in the year 2000 to 1,746 in 2005. In the meantime, the direction of emigration has even reversed itself. In 2008 -- the most recent year with available concrete figures -- there was a net emigration of 10,147 persons to Turkey. Turks are returning to their homeland rather than continuing to invade Germany? But who then will fill the nation's jails and welfare rolls if not them? Nonetheless, it looks as if the politicians in Berlin have long since embraced Sarrazin's problem group definition and tailored their immigration policies accordingly. The numbers, in any case, support the assumption that Germany is sealing itself off. Neither unqualified nor qualified immigrants are apparently welcome. Only poor EU countries, from which the flow of immigration cannot be stopped, still provided significant numbers of new arrivals to Germany in 2008: 8,103 from Bulgaria and 10,447 from Romania. Statistics also reveal that over the past two years the number of people from majority Muslim countries who returned home significantly outstripped the number who immigrated to Germany. Muslims are leaving Germany in "significant" numbers? Now Allah's going to have a conniption fit! And we are by no means being overrun by highly-qualified foreigners either: In 2008, a total of only 157 individuals from non-EU countries were granted permanent residency status -- 71 of whom came from the US. Only 86 non-European or non-American individuals were granted permanent residency in 2008? Looks like Third World immigration to Germany has effectively been 86ed! It is absurd that for years Germany has steadfastly ignored all the warning signals and refused to become a country of immigrants -- with the result that it is now de facto a country of net emigration. For many years, an annual average of 250,000 people came across the border. According to official statistics, however, since 2008 more people have been leaving the land of poets, thinkers and engineers than have been arriving. This puts Germany in a league apart -- along with Japan -- among the world's highly-developed rich industrialized nations. Germany is now a non-immigration First World nation like Japan? In the name of Sacred Multiculturalism, it's time to once again declare war on this Axis of Evil! He/It/She will triumph because the basic conditions for no-god are narcissism, ignorance about and fear of history. Those two necessary-but-not-sufficient conditions rub together to exude the final part of this deadly trinity: a thin film of moral equivalence spread evenly over everything accessible to the senses. Islam fear history too, and goes to great lengths to bury/change it. Their djinns and witches and sorcery will die under the weight of the science Islam is forced to use, even if it is incapable of thinking in scientific terms, except in those cases where it is useful for their project. Until the superstitions cave in, they will need us to prevent whatever they touch from turning into a goat-barren desert. At bottom, Islam has no god either but they've given their null set a name. Nah, nah, they win. Yea, it seems like the evil God, or better put, the evil version of the God of Abraham, is going to triumph....right at a time when the world breaks down in a way that has never been seen before. When the global humpty dumpty economy falls, no one will be able to put him together again. Just like the Great Depression brought Hitler, this coming calamity is going to unleash some virulent hatreds, that's for sure. Already the Greeks are tilting towards political extremes. Amazing what people will do when there is no food on the table. I hate to be negative here, but there is a very real possibility that we are looking at "nation against nation, kingdom against kingdom" here. Wherever the carcass is, there the vultures will gather, isn't that what they say? Tekuan's essay shines light on some of these charming birds. What clinches it for me is the intersection of this global calamity, with the rise of the evil version of Abraham's God. After the horrors of the 20th C, unending civilizational warfare in an interdependant world is just too much for people to stomach. I have a bad feeling that people will be willing to say "alluha akbar" in a pathetic attempt to create order and peace. It is happening already, after all. This time around they aren't going to sell out and call it "Peace in our times", they are going to call it a MIRACLE. Curse the waiter who gave me the fortune cookie telling me I was going to live in interesting times. One last thing I forgot to mention. My guess is that the Good Samaritans of this world, be they from WHATEVER ethnic group or religious background, are at the very end going to see world events one way, while the scumbags of every ethnic group on earth see it in another. The Good Samaritans will have their eyes opened, and see the truth for what it is, while the others who never cared, or sold out, will persecute the truth-tellers for calling the "miracle" a colossal farce. Decent souls will be hated by all nations, merely for having the stones to call out the evil elephant in the room for what he is. This is just a guess, though. Unfortunately, it is an educated one, provided you think Jesus was who he said he was. I have some objections to your characterizations of Christianity vis a vis the Englightenment and Reason TS. Too tired to expound upon them. Reason was long embraced by Christendom, and Aristotlean thought was the Establishment for centuries. The Englightenment came about as a culmination of many Christian elements and the foundations created by Christendom, especially the Catholic University system. The Anti Christian lies and propaganda are deeply seeded, when even those defending and apologizing for Christendom believe them. "Third, the Nazi period is a terrible and eternal stain on Germany and on humanity itself, but the precepts of Christianity and the Enlightenment survived Hitler." Once again a great job by Takuan! Does not look to good for Sweden and Norway though. And what on Earth has "atlas"got to do with Islam? "The question is why. Why is this journalist and this magazine deluded on Islam? And why are all Western mainstream media deluded on every subject of importance they touch?" The Western media, as the ruling class it represents, are not deluded on Islam. All three, media, rulers, and Islam, share a hatred of the West. The motivations of Islam are well known and evidenced by reports such as can be read about at GoV and elsewhere. The motivations of Western elites, in their incessant appeals for dhimmitude among the native populations, are the establishment of a new order – sans Christianity and the Judeo/Christian ethos that had been established over a millennia and had dominated over a second, including being a thorn to Islam in the Levant and a liberator, from ascendant Islam, in Europe. The new order, in eradicating the old order, its traditions, understandings, and forms – see, for example, what is being done to marriage, is the work of yet another emanative evil, less well known and never firmly established but evil nevertheless – Gnosticism. The two social disorders are now ascendant and operate on the scheme, 'the enemy of my competitor is my enemy'. Unless the vestigial Christian remnant in the West becomes, once again, robust and dominant, The West is doomed to yet another so called 'dark age', this one blacker than the first and the result of two social pathogens. As a nonbeliever, I wonder sometimes if Christian ethics are not at least somewhat responsible for the awful condition of our mass media and political climate. Takuan claims the religion's moral and ethical precepts to be core to the West, and yet... can it not be said that the programme of "Love thy enemy", of raising the virtues of poverty (and thus indolence) is the agenda of the great foes of our modern civilization? @Anonymous, who wrote: "And what on Earth has "atlas"got to do with Islam?" You poor uneducated bigot! Do you not know that the Atlas Mountain Range runs 2500 miles through northern Africa, including the countries of Morocco, Tunisia, and Algeria? And what do those countries have in common? They are Islamic, of course! Without Islam we would not have the Atlas Mountain Range, and the Greeks would not have conjured the god Atlas, and without the god Atlas, the world would have tumbled into the sun. So you see, we must thank Islam not just for its contributions to Germany, but for saving the Earth itself. You ungrateful western slob! Oh, and without Islamic "alcohol" we would never have Bock or Roggenbier or the Reinheitsgebot (German Beer Purity Laws.) And without those we would never have humpen or beer gardens, communal singing, or probably even lederhosen. Islam, Islam uber alles! Now drink up, anonymous -- just don't let the local Imam or taxi driver catch you. a pot-addled, Communist managed, Marxist/socialist, subversive slacker named Barry Soetoro. This is even worse then you described. He has done som much damage it cannot be fixed. Indeed if we were able to elect someone who both knew how to fix it and was willing to do what must be done the "cure" would seem as bad as the illness. We are on the brink of a massive worldwide super depression and the abyss is staring back at us. We cannot avoid it. It will unfold, slowly at times when enough money is borrowed, taxed or printed to defer the worst effects and more quickly as unanticipated hot spots flare up. It will either: go on for years perhaps a decade or more OR worse it will cause another world war just as the great depression set the stage for WW II. Millions will die and millions more will suffer before this is over. There is no way out, at least no way that human nature would allow us to follow. Watch as the collapse progresses how the left trys to shift blame to anyone else especially anyone trying to bring our budget and tax system back to reality. Why worry? Given amnesty, Obama's 800,000 under-30 illegal immigrants will solve our problem! Everything you say about the ruling class’s motivation is true, yet it cannot be the whole answer. If these people were the standard Communist kind, militantly secular and as suppressive of Islam as the Bolsheviks were, everything would fall into place in my understanding. But the alliance with Islam eludes all rational explanations. These are not uneducated yokels we are talking about but products of the best universities. They must know that replacing Christianity with Islam will get them much more of what they hate about Christianity, not less, if no longer in a white, humanist garb. They also know that in the manner of Martin Niemöller’s “First they came for the communists” (etc.) they may be the last to be dragged under, but they will be dragged. In the case of Jews prominent in the zombie phalanx, i.e. people like Bloomberg and Schumer in the U.S., Cohen in Holland, the Millibands in the U.K., their turn will come much sooner than that. So, again, why? I call it insanity, and by a clinical definition of insanity, it is. But Voegelin’s explanation accounts for the phenomenon too, and is more comprehensive: Gnosticism. They are actually members in a cult. The main thing is that they have unplugged their rational brain. To Anonymous: You can't have the 'Christian Ethic' without the Christian God. They go together and don't go alone. The West's problem is uplifting a perverse 'Christian Ethic' separate from God. Such a move is condemned to a divine curse. Maybe that's tough for a non-believer, but for an enlightened believer, it's common sense. Anonymous: Furthermore, while the love thy enemy is indeed sound Christian ethic, your understanding of poverty as a virtue is a crooked interpretation of Christian Scripture and any avocation of indolence can accurately be described as anathema to Scripture and anti-Christian in the extreme. Allow me first to say how much I have enjoyed your critiques dating back to the 'From Meccania to Atlantis' series - all of them wonderfully expressive and full of historical perspective. Thank you. As for the insanity of the cult, that is as good, though naturally unsatisfying, a reason as can be had. I would add that ancient pagan Gnostic cults of the third and fifth centuries exhibited the same crazy cult phenomenon and I think this a natural disposition of Gnosticism – disordered, chaotic, contradictory and conflicting precepts that require both, a suspension of reason, and the preponderant influence of an obdurate 'faith' in its radical exceptionalism. This disposition of Gnosticism may well have served as template for Islam in the event the Prophet had need of one and it is no surprise that the Gnostics and Islamists should find each other kindred spirits. I fully suspect that those of the West who should expect to be dragged under will in effect go native; they will become converts to Islam and I further suspect they will be more pious, merciless, and ruthless than the maddest of imams. I have had this thought for some time now, that we are living in a modern version of the Dark Ages, another Medieval time. For all the supposed technological advancements (which for the most part are mere toys for amusement of the masses) we are in a severe downward slope in critical thought. Not at all an enlightened period. Nothing positive seems possible anymore. The way forward is actually a reverse, Hope and Change is give up hope and accept his change. Alice in Wonderland indeed, up is down and truth is a lie. Orwell's double speak "Joycamp" is actually forced labor camp. We are accused daily of racism when simply trying to engage discussion or debate on policy. Debased thinking passes for intellect? Do you mean I must read your article before commenting? A pox upon your house. Wait a sec. Never mind. You went pretentious with, '...tale of a serendipitous creature...' Sorry, I can't help you. Your blog is far too intelligent and pretentious. So, it must be wrong. Plus, Fort Apache is on. A recent trend I've noticed among the Euro-enthusiast mass media is the gradual dropping of the moderate mask. A few years ago, maybe even a few months ago, if I read an open plea to "leave the EU behind and move forward to the United States of Europe" like I've read today in El Mundo, a supposedly right-wing Spanish newspaper, I would laugh it off as a not-so-subtle joke. But it's no joke, it's for real. Such pleas are becoming ever more frequent and earnest. The disconnect between mainstream media and common sense is increasing at breakneck speed. Does anyone really believe Northern European populations will let the debt-prone Greeks, Spaniards and Italians have a say in their fiscal policies? Where are we going and when will we arrive? What will happen then? I'm not sure I want to learn the answers. I think it is a manifestation of self hatred, self abhorance....and expressed intellectually in many ways, one of which is the ascendance of Third Worldist Nationalist Maoist Anti Imperialism....others are the the Extremist Enviromentalism, in which we despise our technological advancement and command of nature....demonize it as hostile to the Gaia....straight up misanthropy, really. Hey, The Lights Are Flickering! An Alternative Media Reality in Syria? Cultural Enrichment? None For Me, Thanks! Jihad! Jihad! We ♥ Jihad! Say No To German Patriotism (Again)! Say No To German Patriotism! Is Germany About to Have a Tea Party?